The Polina antique brass 3 light classic chandelier, featuring large crystal elements, an opulent lighting range featuring 24% lead crystal spheres. Can be converted to a semi-flush fitting for rooms with a lower ceiling. Stunning antique brass 3 light fitting, with classic curved arms finished with candle pans and candle tubes. Each arm and the main central column is decorated with a high quality crystal sphere. An elegant and impressive addition to any small room. 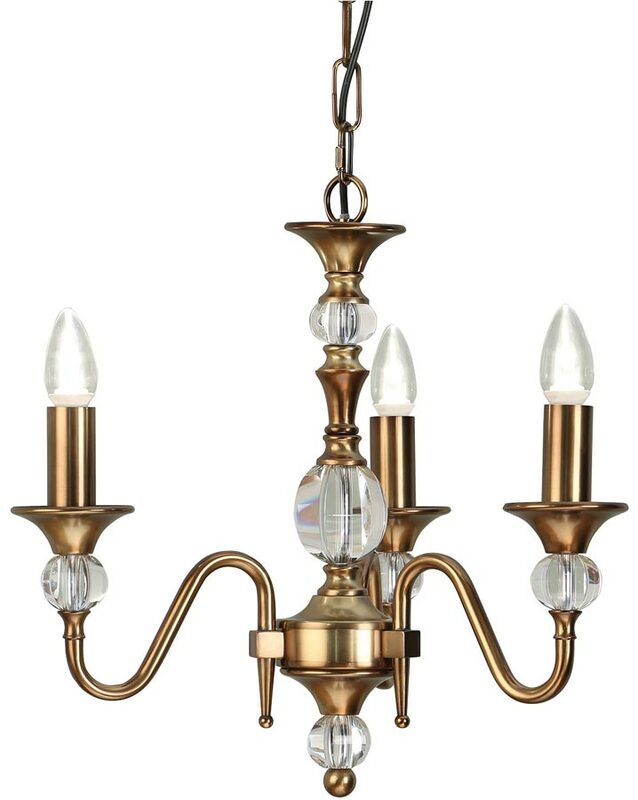 Finished in soft antique brass and adorned with k9 crystal glass detailing to give it an opulent feel. Suitable for use in living areas, hallways and reception rooms. An elegant, timeless design well suited to both traditional and modern interiors. Height adjustable at the time of installation, minimum height 40cm, maximum drop 150cm. The Polina antique brass 3 light classic chandelier, part of the New Classics collection, designed and manufactured by Interiors 1900.